Atoms and ions, such as laser-active ion in laser gain media, have various excited energy levels. Transitions of such atoms and ions to lower-lying levels are often associated with the emission of photons (light). The generated photons carry with them the difference of energy between the involved energy levels. However, there are also mechanisms which allow for non-radiative transitions (or nonradiative or radiationless transitions), i.e., transitions not involving light. The excess energy is then dissipated in some other way – in most cases, in the form of phonons, which are associated with lattice vibrations of a solid. In liquids, similar phenomena can occur, but hardly in gases, where the atoms or molecules are not in contact with others for most of the time and therefore hardly have a chance to dissipate excitation energy non-radiatively. Phonon emission is a very rapid process in solids in cases where the transition energy is smaller than the energy of some of the phonons of the lattice. The radiative transition is then effectively bypassed and cannot be observed. 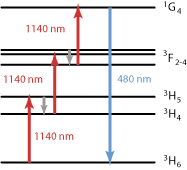 For larger transition energies, only multi-phonon transitions are possible, where one transition involves the emission of multiple phonons. The rate of such processes becomes rather small when more than about three phonons need to be emitted. There are also quenching processes related to impurities or lattice defects, which have additional electronic levels to which excitation energy can be transferred. Such impurities or defects may affect only those ions which are sufficiently close to them, unless the laser ions are sufficiently close to each other to facilitate rapid energy transfer between them. Nonradiative transitions tend to decrease the upper-state lifetime of laser gain media and thus to decrease (quench) the upper-level population, unless the nonradiative transition rates are negligible compared with the radiative ones. In that way, the gain efficiency (for continuous pumping) is reduced by non-radiative decay, also possibly the maximum achievable laser gain. 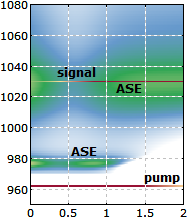 Note that nonradiative transitions are essential for the function of many solid-state laser gain media: they often facilitate the population of the upper laser level, if pumping occurs to a higher-lying level, and they also often help to depopulate the lower laser level and thus to avoid reabsorption losses.